Revenge of the Sith dominates the Prequel Trilogy in a way that none of the classic films dominates the Original Trilogy. In interviews, George Lucas admitted that this movie contains over 60% of the material from his original story outlines (with The Phantom Menace and Attack of the Clones splitting the remaining 40%). Many consider ROTS to be the best of the Prequels, but it has way too much story to cover in two hours. Anakin Skywalker’s fall to the Dark Side happens too quickly to be believed. Major characters like Padmé Amidala have no character arc on screen. The ending races to wrap up several major plot lines and set everything up for A New Hope. As much as I enjoy the film for its standout moments, it always felt a bit too rushed. 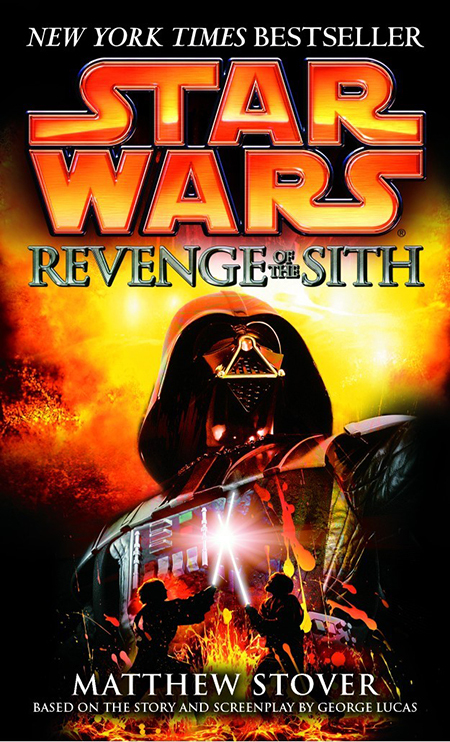 In fact, I didn’t read the Revenge of the Sith novelization until around 2010. Ultimately, I’m glad I did. The novel helps to explain what was depicted on screen. It fleshes out the story in countless ways, but most importantly it clarifies Anakin’s motivations for going to the Dark Side. In the movie, Anakin comes across as petulant when he complains about not being awarded the rank of Master. The book explains that Anakin sought restricted knowledge in the Jedi library that might save Padmé from death and had hoped the rank of Master would grant him access to the archives. Stover also spends more time on the political maneuvering between the Jedi and Palpatine, showing how Anakin finds himself caught in the middle. Meanwhile, Palpatine provides a fairly convincing explanation of Sith philosophy as one that embraces human existence rather than the Jedi dogma of non-attachment. In short, Anakin’s decision makes much more sense and comes across as even more tragic than what comes across in the final film. are going to wish they’d stayed in bed today. This passage brilliantly not just establishes the camaraderie between Anakin and Obi-Wan—something the films themselves arguably never did—but also gets at the core tension in the story, and indeed the Star Wars franchise. Yes, the Jedi are superheroes with extraordinary powers who fight evil. But they’re also only human beings, with all the flaws and virtues that entails. Both the children and adults are right, but neither appreciates the bigger picture. Anakin is both the conquering hero who routs Separatist armies and the insecure teenager who gives in to his human lust and anger. Stover also manages to provide brief but memorable character vignettes that get to the heart of the major characters. His description of Obi-Wan as the Jedi who excels in both wisdom and combat but is too humble to recognize his achievements perfectly encapsulates Obi-Wan as the quintessential servant-warrior. For Anakin, Stover uses an extended metaphor of a dragon in his heart remaindering him of what he has lost and stands to lose. It’s an effective way of depicting the character’s inner turmoil (something difficult for even the best actors to convey on screen without extensive monologues). Even Count Dooku, who was criminally underutilized in the films, gets a whole chapter exploring his psyche. Stover’s novelization can’t stand alone, especially as it can’t convey the film’s stunning visuals, but it supports the movie in a way that few other novelizations have. Although Lucasfilm obviously meant for the movie to take priority, the two feel like equally important components of the same story. Star Wars expert Nathan P. Butler even coined the term “Stover effect” to express how reading a novelization can improve the overall quality of the source film. In fact, I can’t recall any other instance in which a movie and its novelization complemented each other so well. It’s a shame that more artists haven’t tried multimedia storytelling, using different media as complementary storytelling devices. * Lucas and Stover show how it can enhance the overall experience. * Ironically, Arthur C. Clarke and Stanley Kubrick collaborated on 2001: Space Odyssey, but there are several major contradictions (in the book, the Discovery goes to Saturn, not Jupiter). Moreover, the movie so overshadowed the book that Clarke’s sequel follows the film, not his own novel. Well done… not only have you inspired me to rematch the movies, but now I can’t wait to read the novels ….